Now is a good time of the year to take Euphorbia cuttings being Australia's Autumn, and I can hear you say why not in Spring? well you can still take them in Spring, but I like to take my Euphorbia cuttings in Autumn because the Spring cuttings can go straight into flower and then the cutting can die. But if taken now you have quite a good stem and you can nip the tip out before Spring preventing the cuttings from flowering and the plant will branch and you will have some nice new plants to replace old scraggly ones in the garden. Before you start to do Euphorbia cuttings you need to be aware that if you get the sap in your eyes it will sting for a very long time and you will be in a lot of pain, so wear glasses and rubber gloves because you can be allergic to the sap. The Euphorbia plants have some lovely new growth at the moment, if you look down towards the base of the plant you will see new shoots coming away. Take your tip cuttings from that strong new growth about 8cm in length and into a #3hormone powder and using a dibber make a hole in the perlite and peat. If you just push the cutting into the perlite, it could push the bark of the cutting away from the stem, causing rot. Water in well and leave for about 2 months and when rooted, pot up and sprinkle with a small amount of granular fertiliser. The cuttings I have propagated are Euphorbia martinii from Plants Hunters and a Euphorbia characias 'Tasmanian Tiger' that I purchased from Barbara in Tasmania not long after she found the variegated seedling in her garden. Dan Hinkley had seen the plant and thought Barbara & Sally should register the plant with "Plant Breeders Rights" as he thought it was very worthy, I know it can't be sold or given away without paying royalties. 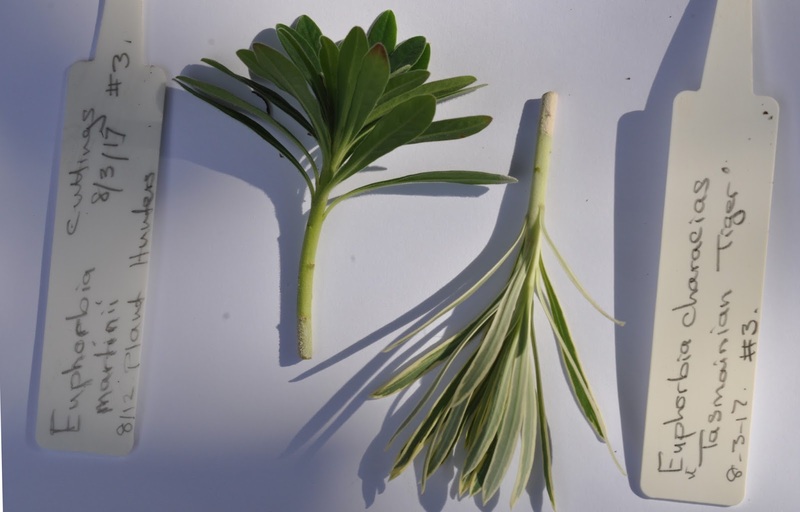 My Euphorbia characias 'Tasmanian Tiger' is getting to the end of it's life so I emailed Sally from Plant Hunters to see if it was ok to do some cuttings for my self and she gave me the go ahead. Even working with plants every day, I do not know how one stands with propagating your own plants for one's own garden, and it does not say on the "Plant Breeders Rights" Web Site either. It does say you can not plead ignorance on the "Plant Breeders Rights", but it does not tell you about doing cuttings for your self either very confusing. Euphorbia martini get to about 60cm to 80cm by about the same in width and has a soft red edge to the leaf and Euphorbia characias 'Tasmanian Tiger' is very similar in height and width and will light up a dark area with its beautiful silver foliage. The Euphorbia's all need excellent drainage and a sunny position, they will tolerate a little shade, on the whole they are a very hardy plant.